places you in command of the US's Mighty 8th Air Force from 1942 to 1945! Each Bomber Group and Fighter Group under your command has individual skills and unique ratings. You get to plan out your strategy to bring down Germany's war-making capability, and then resolve each bombing mission deep in enemy territory! 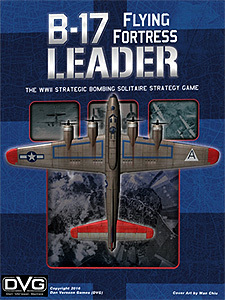 B-17 Leader includes 11 historical campaigns, as well as a Mini-Game where you get to resolve missions for your own bomber through 25 missions, a Solo Bomber option to determine the fate of one bomber in one of your Groups, and down In Flames solitaire rules so you can resolve your air combats using our Down In Flames card game (Down In Flames required for this one). B-17 Leader is a Solitaire Game. You command American Air Groups and make historically accurate decisions, while the built-in game system controls the opposing forces and their strategy. This means you can play the game at your own pace, whenever, and wherever you choose.